On December 1, 2015, the Minister of Health marked World AIDS Day by announcing that Canada would endorse and support UNAIDS/WHO 90-90-90 targets. By 2020, 90% of all people living with HIV will know their status, 90% of those diagnosed will receive antiretroviral treatment, and 90% of those on treatment will have achieved viral suppression. 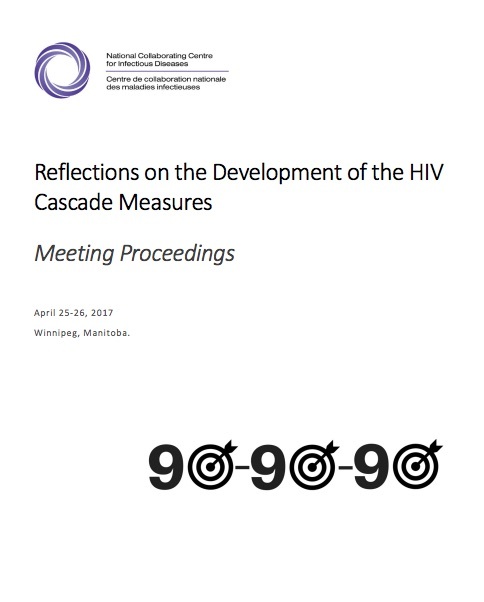 In August 2016, the first exercise to measure the national 90-90-90 estimates began and the Public Health Agency of Canada engaged with provinces, territories and other government departments to develop the national estimates as of the end of 2014. To provide an opportunity to debrief and share lessons learned from the development of the first national cascade estimates, the Surveillance and Epidemiology Division of PHAC, together with the National Collaborating Centre for Infectious Diseases (NCCID), co-hosted a knowledge exchange forum in April 2017. To download the meeting proceedings, follow the link below. This document summarizes the lessons learned from this first national exercise, the key challenges identified by participating provinces and territories, and the strategies and solutions discussed to enhance data sources and improve future estimates.